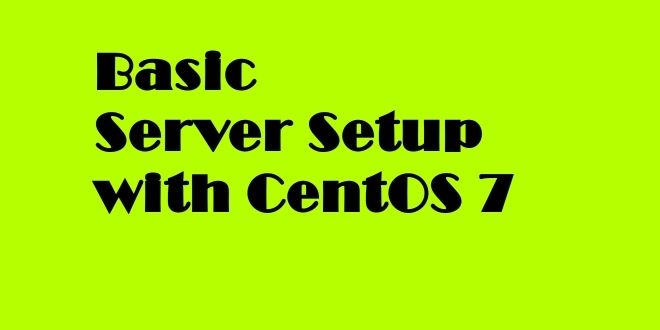 When you first install a new CentOS 7 server, there are a few post installation steps that you should consider as part of the basic setup. This will increase the security and usability of your server and will give you a solid foundation for subsequent actions. To log into your server, you will need to know your server's IP address and the password for the "root" user's account. Note: If you are on a Windows workstation, you can use Putty, SecureCRT or anyother ssh client tool of your choice to access your server. The next step is to set up an alternative user account with a reduced scope of influence for day-to-day work. We'll show you how to gain increased privileges during the times when you need them. To add these privileges to our new user, we need to add the new user to the "wheel" group. By default, on CentOS 7, users who belong to the "wheel" group are allowed to use the sudo command. Now your user can run commands with super user privileges! Enter insert mode, by pressing i, then enter your public key (which should be in your clipboard) by pasting it into the editor. Now hit ESC to leave insert mode. Enter :x then ENTER to save and exit the file. Uncomment the line by deleting the "#" symbol (press Shift-x). Now move the cursor to the "yes" by pressing c.
Now that we have made our changes, we need to restart the SSH service so that it will use our new configuration. Open a new terminal window. In the new window, we need to begin a new connection to our server. This time, instead of using the root account, we want to use the new account that we created. At this point, you have completed post installation steps for your server. You can install any of the software you need on your server now.